It's now been almost six months since I bought my Kindle and it's safe to say that having it has changed my life for the better. I used to read a lot back in my younger days, but that all changed when adulthood hit. I've even tried other ebook readers in the past, having owned both a Nook Color and a Nook Touch over the years. They were fine enough devices in their way, and I enjoyed using them. But I never returned to reading the way I used to. I always assumed that the problem was me and that owning a Kindle wouldn't be any different. 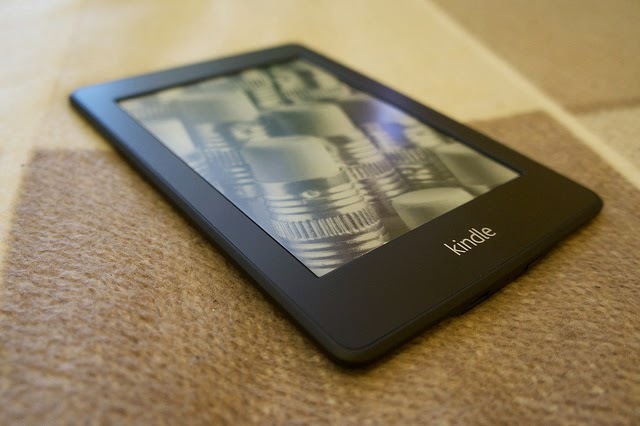 After all, why should the brand of ebook reader make a difference as to how much I use it? I finally caved back in July and got a Kindle. I'm honestly not sure why I did it, it was sort of an impulse purchase. I got the 3G Paperwhite (used, of course, I'm not made of money) and decided to give the reading thing one more try. I missed to be honest. I used to love getting lost in a book, thinking about it when not reading, anxious to get back to it to finish the story. There's nothing wrong with physical books, of course, but I simply don't have time to browse libraries and I don't have the money to browse bookstores. Plus, hauling around a large hardback book around is tedious. Believe me, I used to do it a lot...I have very fond memories of the books I read, less so for the space those huge books took up in my various bags and shelves. The past five months notwithstanding, over the past 8 years or so (since getting married and moving to Florida) I sadly only read a handful of books. I read more when I had the Nook, and I read a passing few using various ebook apps on my phone. But I can say with certainty that I have read more books in the past five months of having a Kindle than I have in the rest of the 8 years combined. That's not an exaggeration. Why the sudden increase? It's definitely not the Kindle itself...the hardware is extremely similar to ebook readers I've used in the past. And it's not that my time is suddenly more available than in the past. Quite the contrary. No, the big change is Amazon's ebook marketplace and sheer vastness of it. With the ebook readers I've used in the past, if you have an ebook file that you've obtained elsewhere (yes, there are legal places to do that) it would make the file only available on the Nook itself, I could never use the app to pick up my reading on my phone when I wanted to. With the Kindle, not only are the books largely cheaper (I'll come back to that), but if you have an ebook file you obtained elsewhere , it will still sync your progress between the Kindle and your phone, so you can read wherever you want, even with non-Amazon content. That's huge. Before getting a Kindle, I'll be honest, I pirated a lot of books. With the Nook, most of the books I wanted were $7-10, which is the same price as a paperback. So I would pirate the ebook file and sideload it to the Nook. Sure they offered some deals and one free book every Friday, but most were priced far too high for ebooks. While Amazon certainly has its fair share of more expensive books, the number of titles available for $1-$4 is massive. And every day they offer daily deals of books discounted to $1.99 for 24 hours. I've found a number of books I never would have bought this way, but for 2 bucks I'll give it a try. And two bucks is cheap enough that I'll just buy it instead of trying to pirate it. Of the 21 books I've read so far this year, some of my favorites are ones that are only available on Kindle. I found them through the daily deals or other promotion and liked them so much that they're now among my favorites. But if you search the Nook store or Kobo store, these books are nowhere to be found. They're available in physical form, sure, but not as ebooks from anywhere but Amazon. The number of books only as ebooks from Amazon is surprisingly high. If I were using another brand of ebook reader, I never would have found those books I now count among my favorites. I finally understand now why so many people like the Kindle. It's more than just an e-book reader...there's actually something about it and the entire Amazon ecosystem that actually gets me to read more. And that's a very good thing. Here's to even more books next year! What are you reading? If you care to follow what I'm up to, you can find me on Goodreads.